Wounded soldiers of the Red Army and civilians evacuees from the Crimean peninsula, came from the besieged Sevastopol, go ashore from the board of the destroyer “Tashkent” in the port of Novorossiysk. Until 26 June 1942 the leader carried replenishment delivery of ammunition, fuel to the besieged Sevastopol and evacuation of the wounded soldiers. The sea route from Novorossiysk to Sevastopol lasted 9 hours. 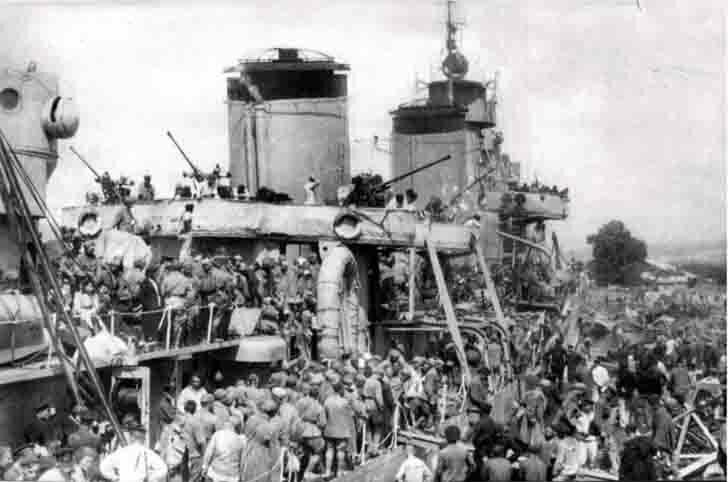 June 27, 1942, taking on board more than 2,100 people, the destroyer “Tashkent” left Sevastopol. The ship was subjected to continuous attacks by enemy aircraft (the destroyer “Tashkent” has a large number of anti-aircraft artillery), 90 German aircraft dropped to the destroyer “Tashkent” more than 300 bombs; “Tashkent” was heavily damaged, but still miraculously came to Novorossiysk. July 2, the day of the fall of Sevastopol, in the Bay of Tsemess Novorossiysk “Tashkent” has undergone sudden massive German air raids, received four direct hits bombs and sank. Of the 344-man crew were killed 76 and 77 people were injured. The depth at the site of the death of the “Tashkent” destroyer was 9.5-10.5 meters and the ship lay on the ground to port. Above the water were only artillery turrets of the main battery, bow cabin and chimneys. In August 1944, it was raised, but the damage was such that the restoration of the ship was not subject to and after hauling in Nikolaev was dismantled the metal.